Bellevue College is the only community college in the state that has its own on-campus weather station with a comprehensive real-time website. 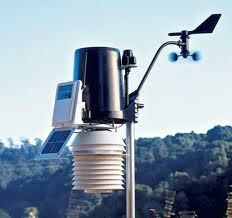 Meteorology is the study of weather and climate. The curious name for this science comes to us from the Greek word meteoros, meaning “high in the air”. To the ancient Greek people, a meteor was anything that fell from sky, including water or ice. To this day, meteorologists refer to various types of precipitation (raindrops, hail stones, snowflakes) as “hydrometeors”. Modern meteorologists study not only precipitation, but everything to do with the Earth’s atmosphere, including clouds, winds, temperature variations, severe storms, climate changes such as global warming, and much more. For prospective students thinking about Meteorology as a career, the Bureau of Labor Statistics expects a faster than average job growth in Meteorology, equating to a 15% increase in jobs by 2018. At Bellevue College, Meteorology is one of five sciences that comprise our Earth and Space Sciences Program (the others are Astronomy, Geology, Oceanography, and Environmental Science).